The landing target services/message communicates the position of one or more targets from MAVLink positioning system(s) to an autopilot. A multicopter or VTOL system can use the message to land with far greater positional accuracy than provided by conventional GPS (GPS provides position within several meters while a landing-target system might reasonably provide centimetre-level precision landing). A positioning system might typically consist of an onboard companion computer with a vision system that can detect a light beacon or target image. Radio beacons and different types of visual markers and tags are also supported. The message used by this protocol is LANDING_TARGET. This is broadcast by the positioning system to indicate the position of a particular target at a particular time. The required broadcast rate depends on the landing speed and desired accuracy; start with rates between 10 Hz and 50 Hz and tune performance as needed. The original MAVLink 1 message was designed with the assumption that the target is captured from a downward facing camera, and provides fields that are relative to the captured image. MAVLink 2 extended the message to provide positional information in terms of standard frames (MAV_FRAME), a quaternion and the type of landing targets (LANDING_TARGET_TYPE). This allows more flexibility for the types of target that can be supported, simplifies the code required by the autopilot, and allows the autopilot to control both landing position and orientation on (some) targets. Different systems may support either (or presumably both) sets of fields. These are discussed below. The positional information can be interpreted as described below. Imagine a ray pointing from the camera&apos;s principal point to the target. The x angle (angle_x) is the angle spanned by that ray and the x-axis of the image plane. The same holds for the y angle (angle_y). In other words, the x angle is a function of the x pixel coordinate of the target (denoted by u̅ in the image below), the y angle is a function of the y pixel coordinate (denoted v in the image below). Using the angle rather than u̅/v̅ pixel coordinates has the advantage that the effect of the camera lens is already accounted for. Otherwise the receiver of the message would need to know the camera field of view etc. The sizes in x and y direction are analogous (size_x/size_y). 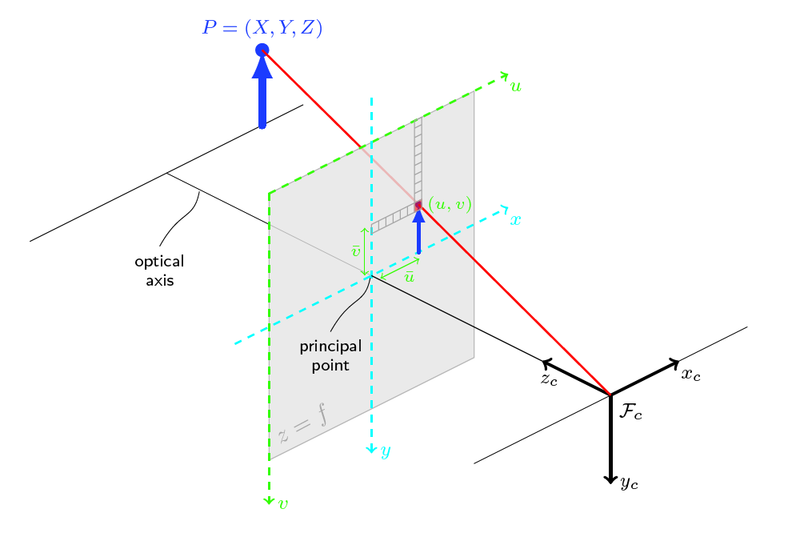 They describe the angle between the smallest and biggest pixel in x/y direction respectively of the target as seen in the image. ArduPilot supports messages with these fields only (at time of writing). The MAVLink 2 extension fields are ignored. The message fields that are used to provide target information as a position/quaternion are shown below. Field meaning and use is clear from the description. frame uint8_t MAV_FRAME Coordinate frame used for following fields. position_valid uint8_t Boolean indicating whether these position field values are populated with valid position target information (1: valid, 0: invalid). The default is &apos;0&apos;, so that if the fields are not populated the default-zero values are not interpreted as a valid target position. PX4 supports this form of positioning in MAV_FRAME_LOCAL_NED (only). The original (MAVLink 1) fields are ignored.